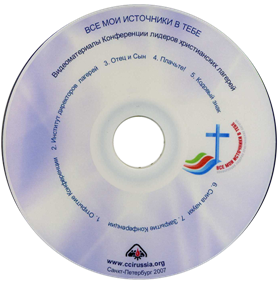 Collection of videos from Christian camps in the former Soviet Union. The collection includes the best videos presented by camps at the 2007 Christian Camping Leaders Conference (St.Petersburg, February, 2007). Producer: Alexander Kharitonov; compiled by: Elena Grigorovich. 17 videos from Christian camps in the former Soviet Union. The best videos submitted by Christian camps at the 2006 winter conference in St. Petersburg. Compiled by: Elena Grigorovich; Producer: Alexander Kharitonov. Video from a youth camp for knights, conducted August 5-11, 2008. Camp video. July 2006. The mountains of North Caucasus. The forests around the village Tkhamakha (which translates from Circassian: "The Voice of God"). Extreme tent camping for young men. A place free from the presence of women of all ages. A place for developing a man's character, will, and responsbility, and an encounter with God. The DVD includes: CCLC Opening and Closing, Camp Directors Institute Presentation, Father & Son Video, a touching sketch named Cry!, Chronicles of the Christian Camp Code Sign for Young Men, Power of Science video patchwork. The Festival was held at 2007 Christian Camping Leaders Conference. The DVD includes praise & worship, poetry, pantomime, monotheater and shadow play by performers representing the Neva, Kuban, Volga and Amur Areas, the Baltics, and Belarus. Filmed at the January 29-February 3, 2006 Christian Camp Leaders Conference. This DVD set includes all five evening programs: the complete sermons of Ilya Gritz, worship, performances by camp representatives from 15 countries. Bonuses include the prize-winners from the camp video competition and interesting games. Director: Elena Grigorovich; Producer: Alexander Kharitonov. Click the image of the disk to download the compressed video (uncompressed file will be in .wmv format). To order any of our publications, please contact our headquarters. Please note that publications may or may not be in stock at time of order (books may be in the process of being printed or possibly out of print). Prices listed below are for Russian-language publications only. Prices include shipping costs (to non-CIS Europe & North America) and are subject to change without notice.